The kilt is part of the traditional Scottish costume, to wear in disguise or evening dress. The MacLeod tartan originates from the Highlands and more specifically from the MacLeod clan of the Isle of Skye. The kilt is adjustable at the waist thanks to 2 small black belts at the back. It is woven 100% wool quality. As the years go by, the kilt developed in other countries than the original one. 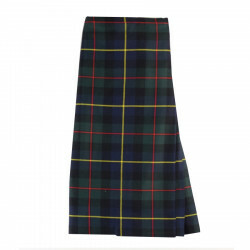 As in America or France (Brittany), where new tartan patterns were created. This article is a special order. Sizes may still be available in our shops or delivered within 3 months by our supplier. Contact our Customer Service on 02 98 85 47 37. Please specify the French size when ordering.